Cough experts say many over-the-counter cough medications probably aren't worth the money. The cough is one of our basic defense mechanisms. This reflex and that unceremonious expulsion of air, mucus, and microbes spares us all sorts of infectious and inflammatory pulmonary misadventures. But who hasn't had too much of a good thing? When the hacking becomes relentless, it can keep us up, wear us out, and lay us low. Most people first seek relief from one of the countless number of over-the-counter cough medicines. But many of these over-the-counter cough medications have little evidence of effectiveness. While coughing exists to protect us from infections of the respiratory tract, it is commonly found with other conditions, too. We associate asthma with wheezing and difficulty breathing, but for many, its main symptom is a cough. Heartburn is the cardinal symptom of gastroesophageal reflux disease (GERD), but the stomach acid irritating the esophagus and the back of the throat can also produce a nasty cough. Coughing is also a side effect of several drugs, most notably ACE inhibitors such as lisinopril and enalapril, which are mainstays in the treatment of high blood pressure and heart failure. 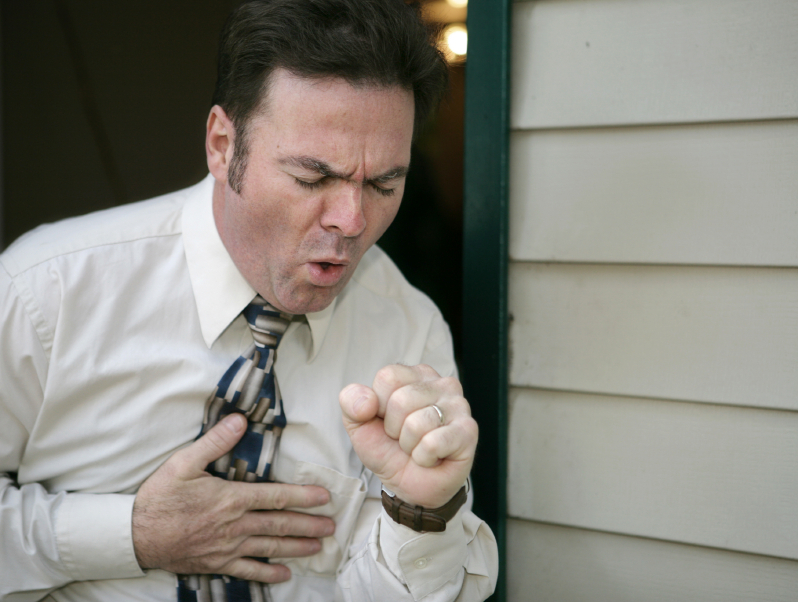 The ACE inhibitor cough sometimes begins months after you start taking the drug. Fortunately, there are good alternatives for those who have this problem. Chronic obstructive pulmonary disease (COPD), bacterial sinusitis, lung cancer — all may announce their presence with a cough. And, of course, there's the infamous smoker's hack. But among nonsmokers, the most common cause of a cough is that humdrum malady, the common cold. At least 200 viruses are capable of causing a cold, which is one reason why it's so common. When the viruses take up residence in the moist, dark recesses of the nose and upper respiratory tract, the tissue lining those cavities doesn't take kindly to the intrusion and responds by producing mucus above and beyond the normal output of 1–2 quarts a day. One result is postnasal drip, a trickle of mucus and other secretions that stimulates nerves at the back of the throat and triggers coughing. This ticklish situation becomes even more so because some infections seem to make upper airways more sensitive than normal. Several other conditions can also cause postnasal drip and its resulting cough, including sinusitis, exposure to air pollution, hay fever (allergic rhinitis), and other allergies that cause nasal congestion. Postnasal drip triggers a cough because mucus and other secretions from nasal membranes flow down the back of the throat and irritate the upper airways. OTC cough and cold medicines come in a bewildering number of varieties. We say cough and cold remedies because while there are some products marketed purely as cough remedies — often called tussins — many have additional ingredients that are supposed to control cold symptoms, too. Expectorants. These cough medications work chiefly by affecting the production, consistency, and clearance of mucus in various ways. Guaifenesin (pronounced gwy-FEN-e-sin), which thins mucus, is the most common OTC expectorant. The cough guidelines cite studies showing that guaifenesin is effective, but also point to others showing that it's not. Want a free, reliable way of loosening mucus? Just try drinking plenty of water the next time you have a cold. Suppressants. These cough medications work by suppressing the cough reflex in the brain. Dextromethorphan (pronounced dex-tro-meth-OR-fan) is one of the most common ingredients in over-the-counter cough medicine products. Decongestants. These work by constricting blood vessels, which shrinks swollen membranes and allows more air to pass through nasal passages. As a result, tissues dry out so there is less postnasal drip. Pseudoephedrine (pronounced sue-doe-e-FED-rin), the active ingredient in Sudafed, and phenylephrine (pronounced fen-ill-EF-rin) are the most common decongestants. Decongestants can be wonderfully effective in the short run, but they also present problems. You can become dependent on decongestant nose sprays if you use them for more than four consecutive days. Pseudoephedrine is a key ingredient in the illicit production of the addictive stimulant methamphetamine. You don't need a prescription, but you do need to show ID to purchase it. Pseudoephedrine can potentially make you jittery, interfere with sleep and raise your blood pressure. If you have high blood pressure or heart disease, check with your doctor before using it. Antihistamines. How these work depends on the source of the problem. If hay fever or allergies are the cause of the congestion and cough, antihistamines are true to their name. They block histamine, a natural chemical that makes blood vessels leaky and causes the allergy sufferer's runny nose and watery eyes. But histamine isn't involved in symptoms of the common cold. The older antihistamines like brompheniramine and chlorpheniramine have another effect: They inhibit the activity of the neurotransmitter acetylcholine, decreasing the secretion of mucus and widening airways. Still, exactly how the older drugs suppress a cough is unclear. Some researchers say they may work by blocking histamine in the central nervous system. In the brain, histamine is a neurotransmitter, one of the many chemicals that enable cell-to-cell communication. Products billed as "multi-symptom" solutions often include these older drugs. Analgesics or pain relievers. Many OTC cold medications contain acetaminophen. Doses vary, but are all relatively small (less than 400 mg). The danger is that some people may not realize that cold and cough concoctions contain acetaminophen. If they also take higher doses of acetaminophen (such as Tylenol) for pain, it might cause severe liver injury and possibly acute liver failure. So what cough medication should you take? For your everyday cough from a common cold, a good choice is cough medication that contains an older antihistamine and a decongestant. Older antihistamines include brompheniramine, diphenhydramine and chlorpheniramine. The studies that have guided these recommendations can't possibly reflect every individual experience. If you think a product is working fine, it probably won't hurt you, although you may be paying for a placebo effect rather than a proven remedy. Always keep in mind the other, less common causes of a bad cough, especially GERD and asthma. If you have a cough that you just can't shake, see your doctor and explore the possibility of other sources of your misery. Instead of treating your next serious cough, you might prevent it by getting vaccinated against pertussis, or as it's commonly known, whooping cough. Health officials estimate that over half a million American adults get whooping cough every year — far more than the reported number, which hovers around 10,000. One reason for the gap is that many people don't realize they have the disease because pertussis produces its signature "whoop" of sudden inhalation only in a minority of cases. Often the symptoms are easy to mistake for just another cold, although it may go on to cause a distressing, lingering cough. Pertussis is a bacterial disease, so it's treatable with antibiotics, but only during the first few weeks of an infection. Most children are vaccinated against pertussis, but the immunity wears off. Childhood immunization involves five shots over several years, with diphtheria, tetanus, and pertussis vaccines combined. Fortunately, adults need vaccination for these three diseases only once every 10 years. In 2005, the FDA approved two new diphtheria-tetanus-pertussis combinations, one for adolescents, called Boostrix, and another for adolescents and adults, called Adacel. They resemble the pediatric formulations but contain less pertussis antigen (antigens trigger the immune response that protects you against the disease). An expert committee has recommended that teenagers get a diphtheria-tetanus-pertussis shot, but as we went to press the recommendation hadn't been extended to adults.